A Faraday Cage protects cars from a nearby high-power transmitter. Faraday cages are remarkably simple technology, nothing more than a wire mesh really, but that simplicity belies the fact that such a simple device may be the only thing standing between you and an instant electrified death. 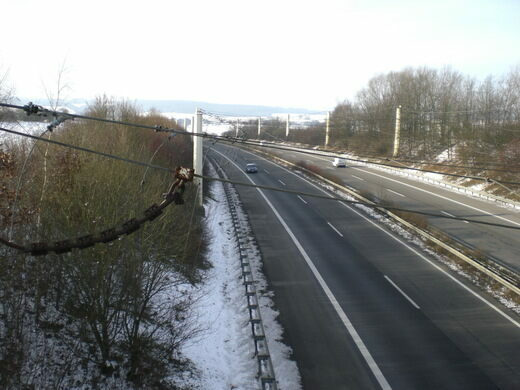 The stakes are not quite so high as instant death at the Heusweiler motorway. To calm fears that the enormous radio power could disturb passing car’s electronic systems resulting in breakdowns of all kinds, a cable network was spun over the motorway serving as a Faraday Cage. The term Faraday Cage refers to the enclosures developed in 1836 by scientist Michael Faraday. A barrier of conductive material is used to block electrical charges, which will follow the path of least resistance across the surface of the “cage,” rather than breaking through. The effectiveness of the cage depends on the type of charge being blocked and the design on the cage. Germany has its very own Centralia, whose spark remains attributed to "spontaneous combustion." Most powerful transmitter in Germany only broadcasts in the French language. A university observatory dome painted like the beloved "Star Wars" robot.